Easily connect and share RS-232 serial devices on wired or wireless networks. Serial Port Emulation Mode: The included Silex SX-Virtual Link software precisely emulates a serial port (or COM port) connection on a computer operating system, and then redirects the packets over the network to the serial port of the SD-300/SD-310AN. Raw TCP Connection Mode: This mode makes it possible to possible to directly communicate with a serial device via TCP application program using a TCP socket API. eCable Mode: Serial data can be tunneled over the network between devices connected to SD-300/SD-310AN. Wired Mode: The SD-300 and SD-310AN are equipped with an autosensing 10/100 Ethernet port. SD-300 is wired only. SD-310AN can also operate in wired mode to connect to the Ethernet network. Wireless Station (Client) Mode: The SD-310AN can connect to an existing 802.11a/b/g/n Wi-Fi network. The dual band capability and enterprise security ensure a stable connection to even the most advanced wireless networks. Wireless Access Point Mode: The SD-310AN can create a wireless network so any wireless client (station) can easily make a direct secure connection. 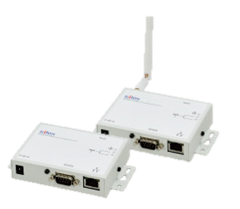 Dual band IEEE 802.11a/b/g/n support on the SD-310AN allows communication in the 2.4 GHz and 5 GHz bands. Radio interference in the commonly used 2.4 GHz band can be avoided by utilizing 5 GHz. SD-310AN provides optimized roaming based on a signal strength algorithm between wireless access points ensuring maximum uptime for the connection.